Giving Technology E-Book Coming Soon! With fewer of us carrying cash in our pockets and more of us carrying smartphones in our hands, mobile giving and technology have become popular topics among church leaders. And they should be. Part of our responsibility to future generations of givers means we need to consider new technologies that encourage generosity. As a church leader, have you ever asked any of these questions? How can we encourage younger generations to give (or start giving)? What should the online giving experience look like? What giving technologies are most efficient and effective? How can my church afford to employ new giving technologies? 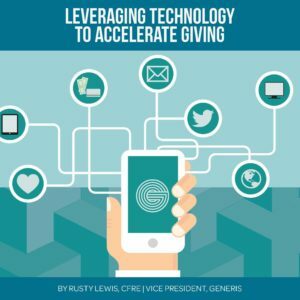 Where do we start when considering new giving technologies? I’ll soon uncover answers to these questions (and many more) in my brand new e-book titled “Leveraging Technology to Accelerate Giving” coming in May. Many pastors across the country asked me questions on this topic in my reader survey late last year, and I’m excited to provide you a very thorough answer in this resource. I can hardly wait for you to have this information all in one place so we can partner together to improve giving technology in the church.